Our ferry arrived in Chania, Crete about 6:30am but there was no huge rush to get off as unloading all the cars and trucks takes a while. So by 7:30 we were on our way in search of a beach for breakfast. By 8:30 it was hot! It was going to be a big day making our way over the mountains to the south coast. We cycled east as far as Vamos and then turned south inland. 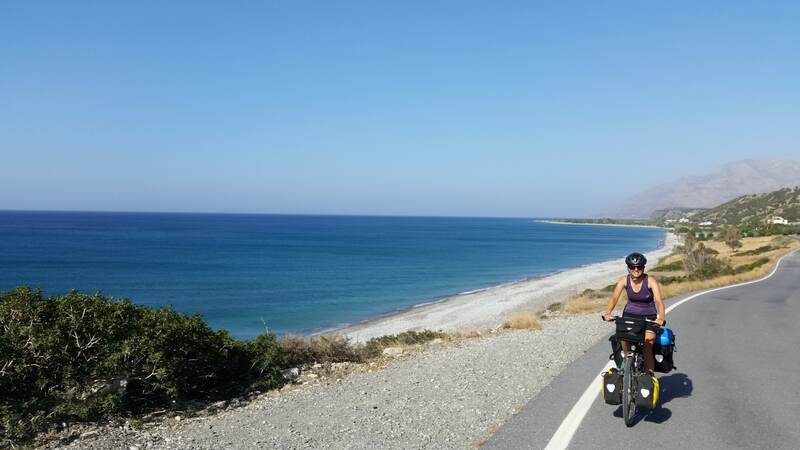 Instantly we got a friendly, relaxed vibe from Crete, this is the island-side of Greece we had heard so much about. An olive oil factory on the side of the road proved irresistible and we managed to get a small bottle to take with us. The owner had told us about a kiwi lady who runs a cafe in Georgioupoli but it was a 6km downhill detour so we sadly missed out, next time! 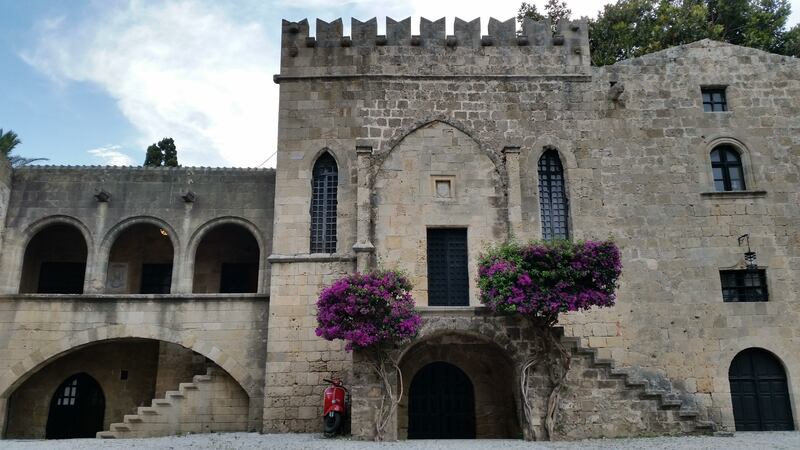 We went through small villages as far as Kryonerida before joining the main road up and over to Imbros Gorge, a mecca for hikers. On the way up we passed a sports field where some local kids had worked out how to turn the taps on to water the astro turf and were having water fights, we joined in and soaked ourselves, which just about kept us cool to the top of the climb. A much needed cool down - thanks kids! 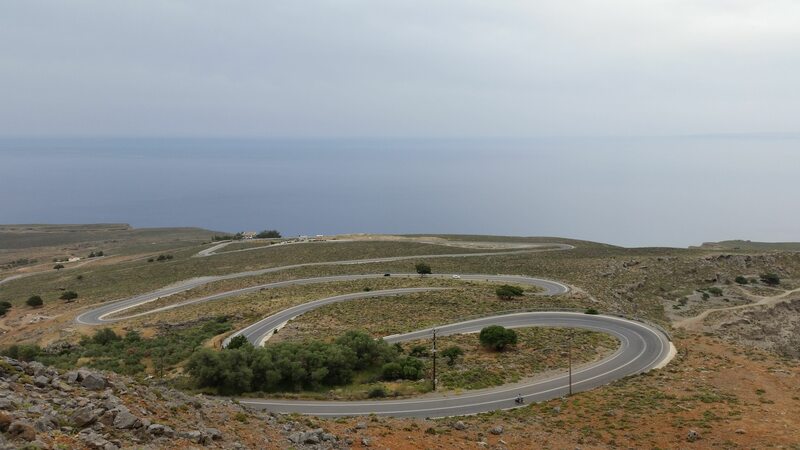 It’s a spectacular descent down from Imbros down to the coast where we stopped for a Sfakian pie. The Greeks tend to call all pastries ‘pies’ so to Jules’ initial disappointment, and Milly’s delight, a Sfakian pie is not a meat and olive filled pie but a cheese filled pancake served with honey, a great second breakfast. 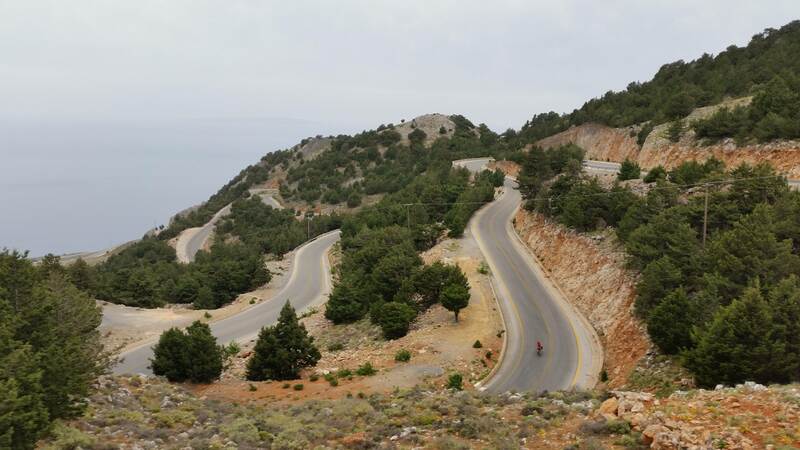 After 17 days of continuous riding and 14,075 metres of climbing my legs were ready to give in by this point. 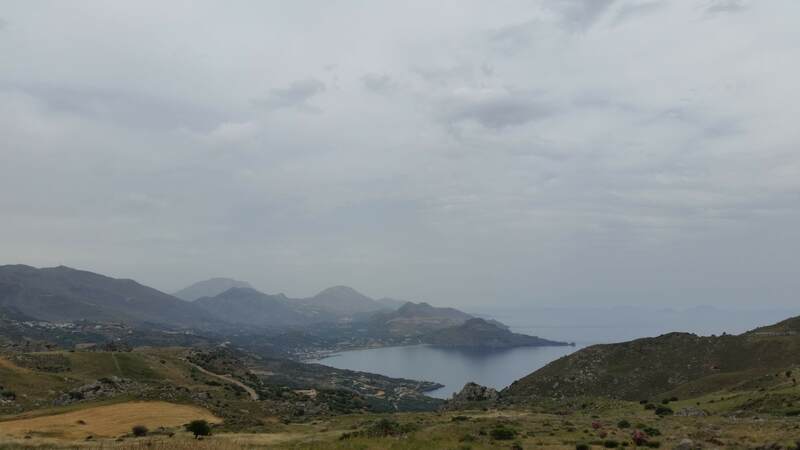 With the heat and winding steep undulations along the coast road thrown in it took us nearly all day to get to Plakias where we took a much needed break. 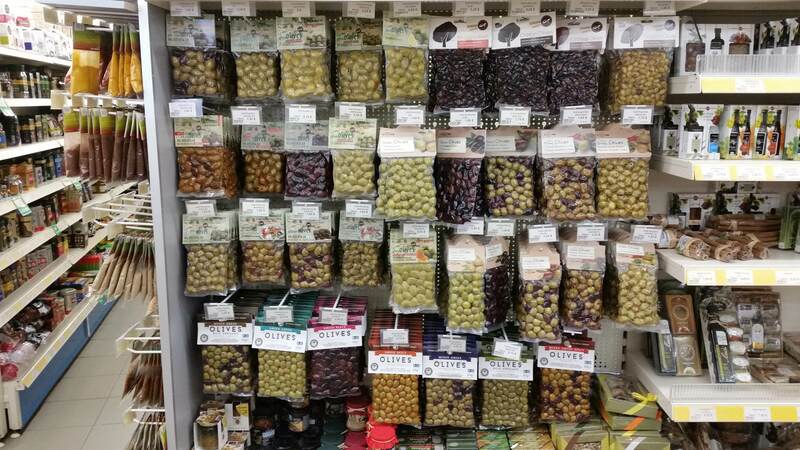 We ate well on Crete! 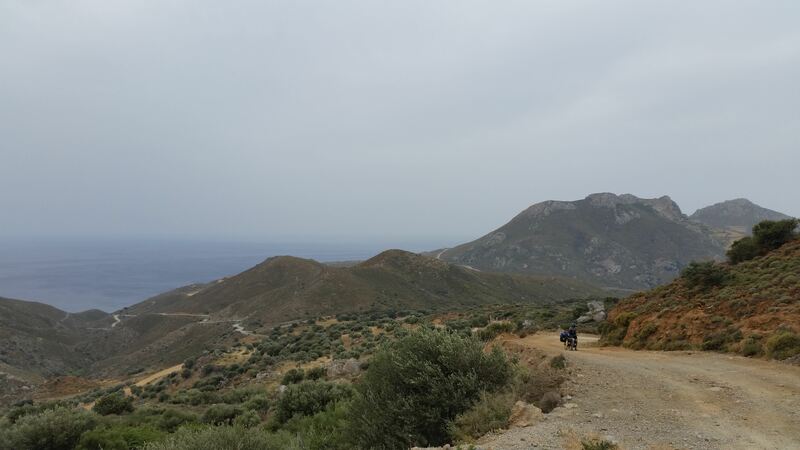 The day we left Plakias we awoke to howling winds, the type that sends chills down your spine when you know you have a day of cycling ahead. It started as a tailwind, although rather than being helpful it was quite a hindrance requiring intense concentration to look out for sideways gusts that can blow you into or off the road! A 10km gravel track shortcut avoided the gorge that would have definitely been a headwind, but was course gravel and still windy so required a lot of pushing. 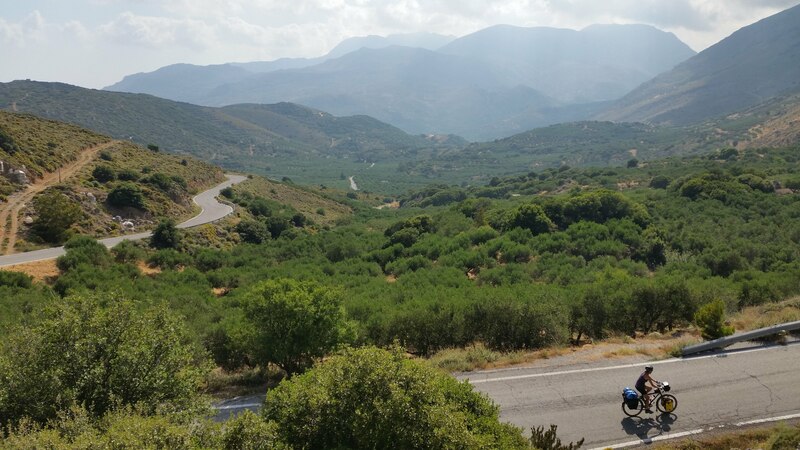 Through fields of olives the road then goes steeply up and then down to Agia Gallini, a touristy spot but perfect for ice cream on the beach. 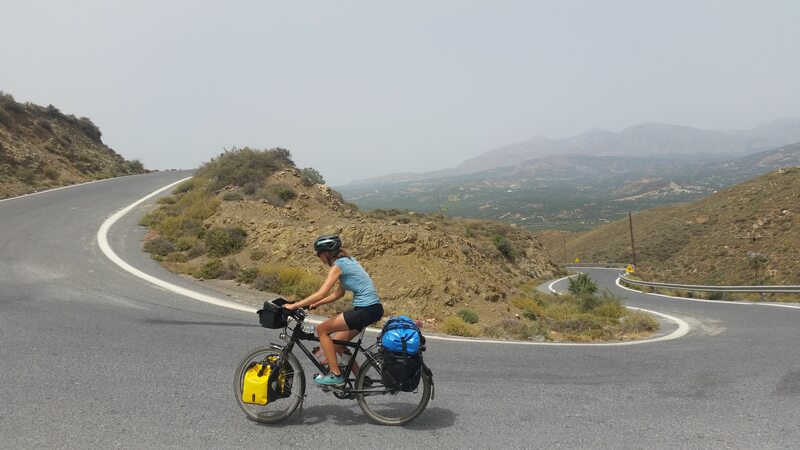 Up again, down again (there is no flat on Crete) we passed through hundreds of greenhouses in Tympaki and met a Dutch guy who’d cycled to Greece and never left! There’s only one way up! Would have been a nice walk without the bike! 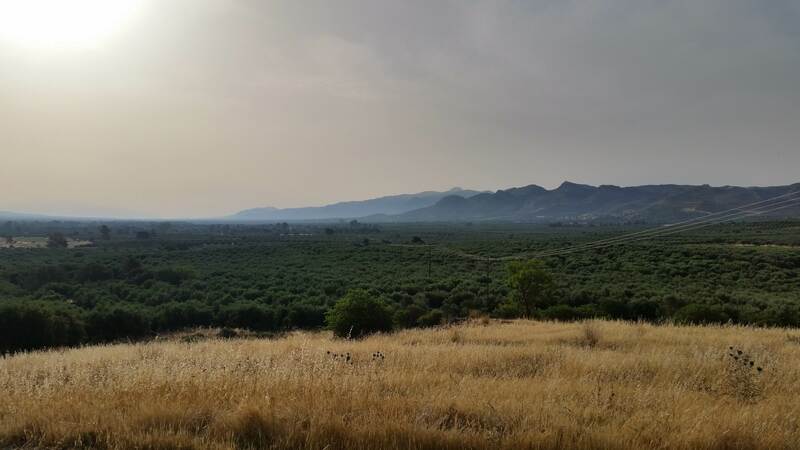 Through hundreds and hundreds of olive trees we hugged the wide valley floor and then headed up to get back to the coast. 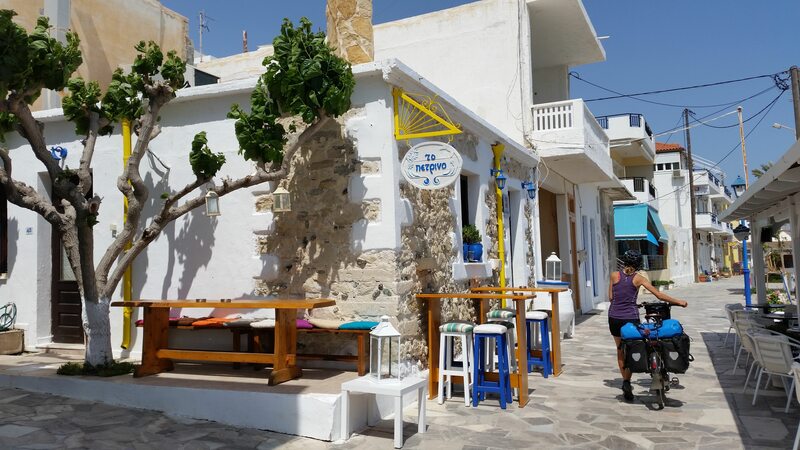 In Pyrgos we found an incredible bakery, but no shop, so Jules asked if we could buy direct and proceeded to choose things straight from the oven shelves - fresh bread, seedy rusks and apricot biscuits. After paying the lady ran after us and gave us a loaf of brioche which we gratefully ate in Tsoutsouros by the sea. From here the road hugs the coast and cliffs, and whilst hard at times it’s a beautiful ride. 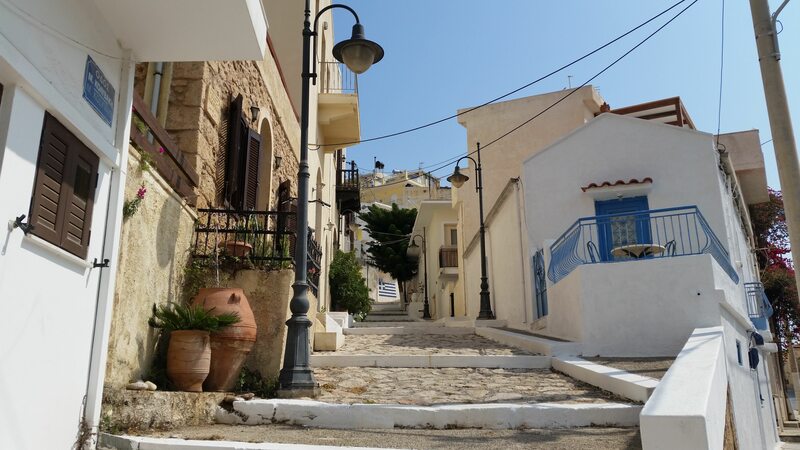 The coastal villages here are unspoilt by tacky tourist shops and we stopped for lunch in Myrtos which had a particularly relaxed charm. As we neared Irepetra huge areas of white glinted on the coast in the sun. Closer up we realised they were greenhouses, housing everything from bananas to chillies, tomatoes, peppers and roses. I’ve never seen greenhouses on this scale and was perhaps naively shocked to see they are all made from plastic wrap, which looks as though it has to be replaced every few years. I don’t know about the environmental impact of this, and a quick google proved fruitless (‘scuse the pun), but with the remnants of plastic we saw lying around and the greenhouses proximity to the sea, I’m not sure it’s so great. Our Warmshowers host in Irepetra also told us about the declining water resources, which is the bigger environmental threat. 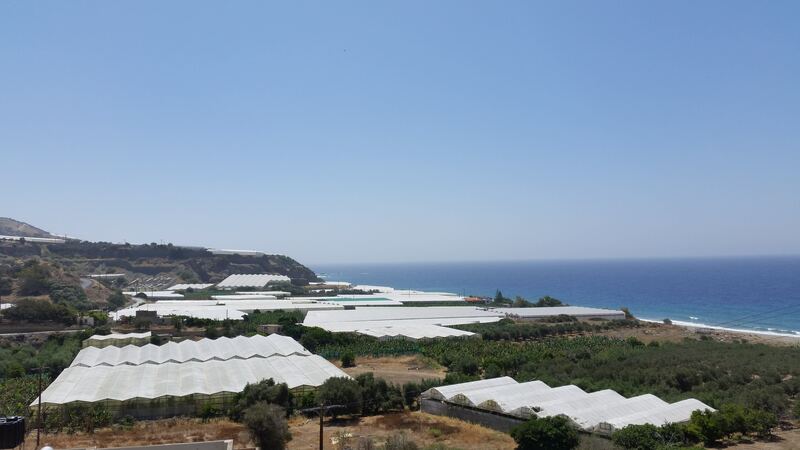 On the other hand Crete is self sustainable on many of it’s fantastic home grown produce so there is perhaps a good balance to be found in that. 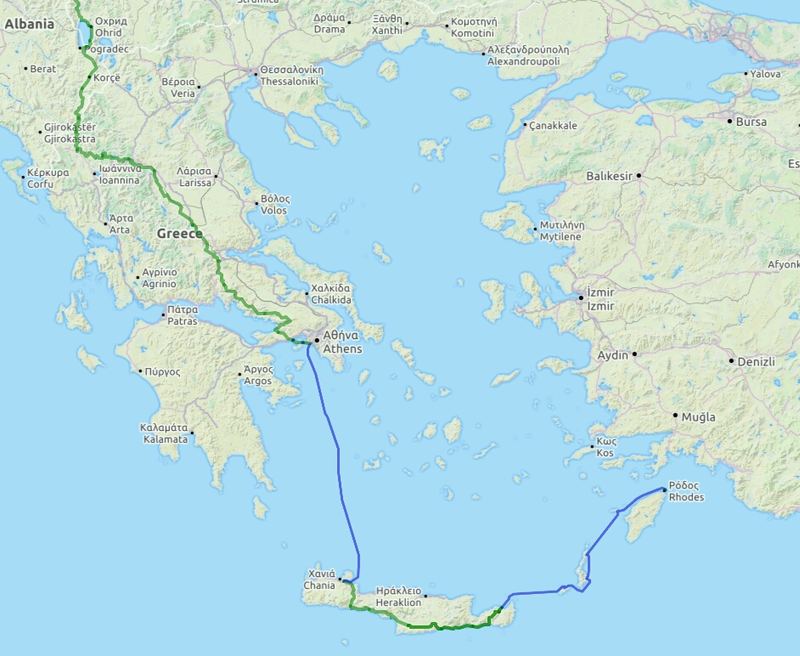 Well fuelled on ‘dakos’, eggs, and fresh veg we crossed back to the North coast via the traffic-free gorge through Chrisopogi. Here we stopped for a snack and were soon made comfortable by three old men who had been sitting in the square. They pulled out chairs for us, showed us the water and kept the flies and hornets at bay with the odd slap of a fly swatter! 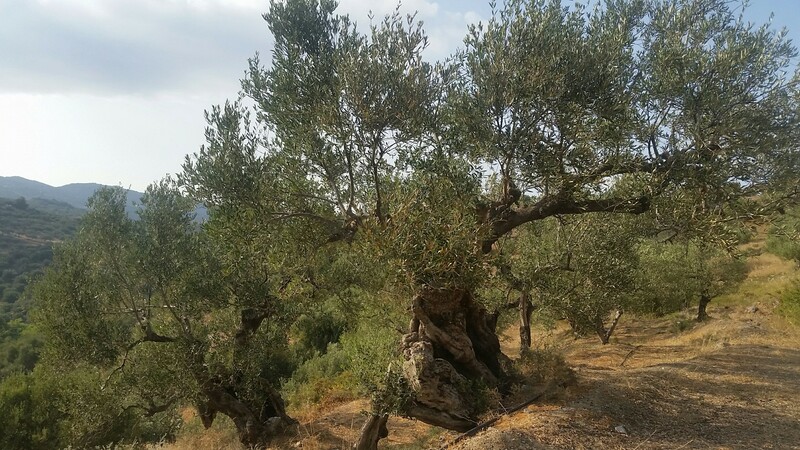 There was a mix of old and new olive groves on Crete, these trees looked ancient. The following day we dropped into Sitia to catch our ferry to Rhodes (which was an apparently standrd 1.5 hours late). 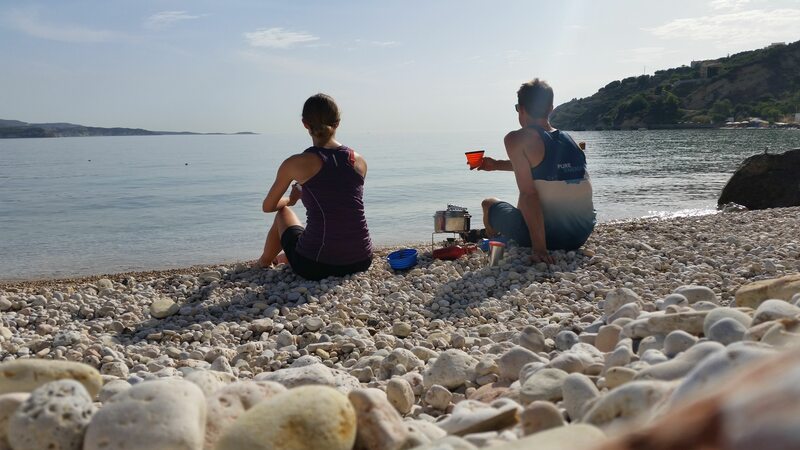 It gave us time for a swim, lunch and beers to celebrate reaching 3000 miles!!! The Rhodes ferry was like taking a tourist cruise, once up on deck. We were glad we bought our own food, it has a good drink selction but a very beige food menu. 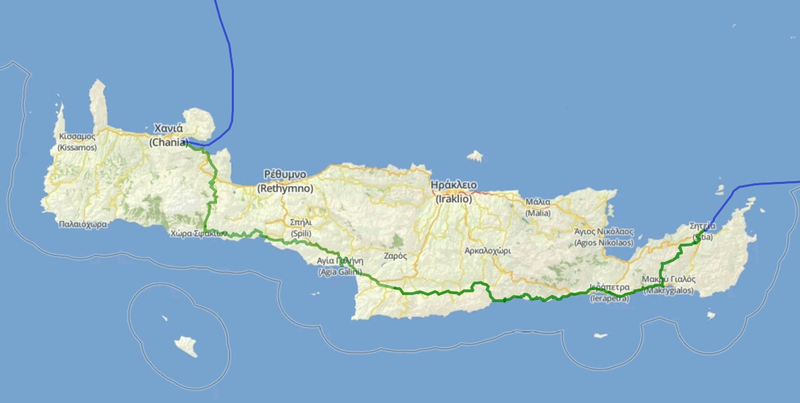 It stopped at a few other islands before arriving in Rhodes at 1am, where we spent the next couple of days sleeping, exploring, doing bike maintenance and catching up on life admin before taking the ferry to Fetihye, Turkey!